Last month I was tasked with filming a five-person interview. Before that, I had done a number of shoots with two people, but five was a whole new ballgame. I have a Tascam DR-40 which has served me well over the years, but it only has two inputs. I did some searching and decided to rent the Zoom F8 in addition to three more Sennheiser G3s and lapels to match with the pair I already have. 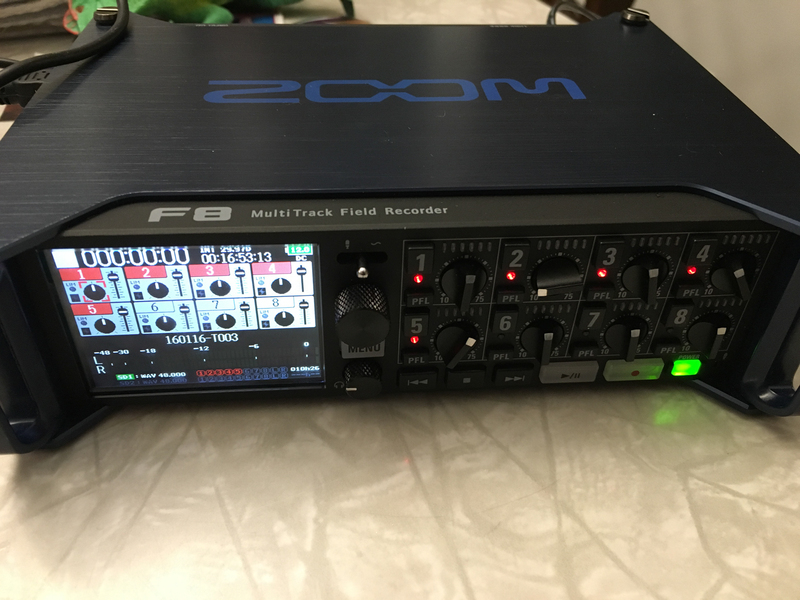 I got the Zoom F8 the day before the shoot and had very little time to configure it. I was hoping it would be fairly straight forward to just pull out and get it up and running without much trouble. Indeed it was! Each of the inputs has it’s own level control knob in addition to the digital console. It also had dedicated play and record buttons which made it easy to start and stop. Being familiar with the Tascam actually paid off because I was able to jump right into the menu and make sure the recording settings were all set. Really the most time consuming part was setting different frequencies on each of the G3s (really, really important!). We did a quick sound check with each of the individuals being recorded and I was able to check each level and keep them relatively even. It let me isolate each signal, and I could do the same in scrubbing through the recording when it was done. After the shoot, I was ready to edit and took a peek at the SD card. Being it was the first time I had recorded multiple tracks, I was a little concerned that there was only one WAV file! I thought for sure there would be five, one for each of my signals. Lo and behold, once I slapped the file into my timeline, it placed each of the five recordings in their own nifty track. So simple! I really liked the Zoom F8 and would love to own one, but filming more than two people in an interview is so few and far between that I’m not willing to drop $999 to get one. Instead I decided to upgrade to the Zoom H5 which gives me a little more options than my current Tascam. I’ll write another post once I let it out into the wild!